Being a Mariners fan just got a little harder. Ichiro Suzuki changed his uniform yesterday. The longtime “face of the franchise” turned in his Seattle Mariners number 51, trading it for the Yankees’ number 31. The deal went down so quickly that many teammates and most shocked fans never saw it coming. 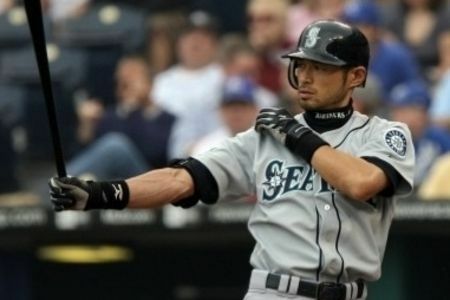 Since he first arrived as a rookie for the Mariners in 2001, the year they made a run at the American League championships and Ichiro earned both the MVP and the Rookie of the Year awards, the Japanese outfielder has established himself as someone unique in a sport where flashy, brash and outspoken characters tend to hog the spotlight. Quiet, methodical, graceful and uncannily gifted, Ichiro won the hearts of fans in Seattle and Japan through his amazingly consistent play. For ten years running he had more than 200 hits a season, won the Golden Glove award, and was named to the All Star team. Yet the Mariners haven’t been back to the playoffs since 2001. In fact, during the six years I lived in Seattle, we considered it a good year if the team came anywhere close to a winning season. For a couple of those years the Mariners and the Nationals both languished at the bottom of their respective leagues. Now, suddenly, the Nats are contenders. The Mariners, not so much. So it’s easy to imagine why Ichiro would welcome the chance to play for the most bodacious, ego-loaded, winning machine in baseball. The Yankees, win or lose, are more than just a team of ball players. They are a team of superstars. And Ichiro deserves the chance to shine with them. Will they love him with the same passion in New York? Somehow, I doubt it. After all, the Yankees are stuffed with talent. They may be jaded to superstars. But I hope they appreciate what just happened. Ichiro is a Yankee. I’ll be damned.